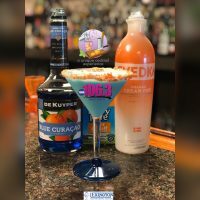 The Hillbilly bartender has your cure for the “Back To School Blues” with this delicious mind blowing blue/orange creamsicle! Enjoy responsibly and stay tuned next week for another Dink of the Week thanks to our friends at Cocktail Creations and The Lexington Bartending School. Happy National Watermelon Day (August 3rd) Here’s a way to beat the heat this weekend… with a Watermelon Margarita!